Lace wig is one of the most expensive wigs, lace wigs are divided into full lace wig and front lace wig. 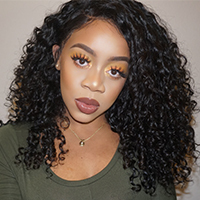 Our full lace wigs are made of 100% Brazilian virgin hair, Swiss lace has refined net gape and is more durable, it is also very comfortable for the user to wear. The making of lace wigs needs to be completed by skilled technician, so every wig product will be in high quality.